This is a simple tutorial on how to navigate and use E-Services. Click on each slide to enlarge/download it. The home page is where you will start after logging in. Here you can see the number of cadets/seniors in your squadron. Click on the numbers (in this case 33 (Cadets) 12 (Seniors), and 45 (Total) to get the list of names and emails. Once you have clicked on the link, you will be taken to this page. Click on a name to send an email. The profile drop-down menu can be accessed by clicking on your name at the top right corner of the Home Page. Here you can change your password/PIN, address, contact info, and characteristics. The widgets/settings drop-down menu can be accessed by clicking on the gears next to your name. Here you can add or remove widgets such as CAP news, squadron statistics, and approvals/validations. You can also change your E-Services settings here. The accomplishments drop-down menu can be accessed by clicking on the trophy next to the gears. Here you can view your personal accomplishments such as your qualifications (GES, Ranger, etc), milestone test results, and duty positions. 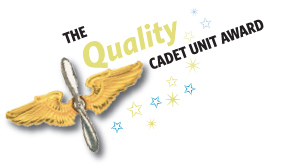 The Cadet Programs pop-out menu can be accessed by clicking on "Cadet Programs" in the left-hand menu. Here you can access Cadet Online Testing, your promotions track report, scholarship applications, and regulations. The Online Testing page can be accessed by clicking on "Cadet Online Testing" in the Cadet Programs or Online Learning menu. Here you can take online Aerospace Education/Aerospace Dimension, Leadership, Journey Of Flight, and specific milestone tests for your next promotion. You can also access your certificates of completion for passed tests. The Online Learning is also in the left hand menu. Here you can find the Cadet Online Testing and Learning Management System pages. Also accessed via the left menu. Here you can register for available NCSAs in the Registration and Payment System. You can access this page by clicking on "Learning Management System" in the Online Learning menu. Here are many tests available, including Aerospace Education, Rocketry, Recruiting, Safety, Professional Development, Operations, Communications, Cadet Programs, Cadet Programs: Milestones, and Emergency Services.